Union County Master Gardeners Sandi Schroeder and Joann Gornowski gave over 700 flowers and greens to cancer survivors at the American Cancer Society’s 10th Annual Relay For Life in Berkeley Heights, NJ for the fourth year. Simon Cancer Center at Overlook Medical Center in Summit chaired the Survivors’ Reception and was overjoyed to be the recipients of the gracious donation. UC Master Gardeners Schroeder and Gornowski created floral arrangements to decorate 34 guest table and speaker bouquets. Four large vases, which were placed on the catering tables, were filled with beautiful flowers such as peonies, roses, foxglove, tulips, carnations, alstromeria, snapdragons, and hyacinth. A special bouquet was given to the Reception’s guest survivor speaker, Deborah Woodbury. 88 cancer survivors, friends, and family were in attendance for a total of 200 guests. Registered guests at the event were given a t-shirt and a plotted plant from Seeds for Hope, a nonprofit (502c3) organization founded by Schroeder. 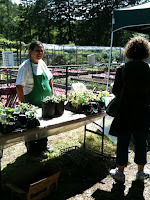 The organization purchases seeds, plants and flowers for the Flower Cutting Gardens with the help from donations. Aside from the reception, Schroeder and Gornowski also donate floral arrangements to the Carol G. Simon Cancer Center lobby. Their beautiful flowers add color to the center and bring smiles to visitors. “Since 2007, Master Gardeners Sandi Schroeder, Joann Gornowski and their team of Master Gardeners have donated more than 14,000 flowers and greens from their Flower Cutting Gardens and from the nonprofit Seeds For Hope. The flowers were given for the benefit of cancer patients and survivors not only at the Carol G. Simon Cancer Center, but at the Wellness Community of Central Jersey, the Susan G. Komen North Jersey Foundation and, most recently, the Emmanuel Cancer Foundation of Scotch Plains. On Sunday, June 12, ECF hosted an afternoon tea for mothers of children diagnosed with cancer. In May 2011, the Master Gardeners of Union County were pleased and gratified to receive a grant of $1,895 from the Westfield Foundation to purchase and install new fencing around one of their Flower Cutting Gardens. This garden was previously besieged by small animals. An estimated 1,500 people participated in the 10th Annual Relay For Life, held on June 3-4, at Governor Livingston High School in Berkeley Heights. The event raised $350,000 for the American Cancer Society. As host of the event’s Survivors’ Reception, the Carol G. Simon Cancer Center raised funds through bake sales, a donation from Art at Overlook, and grants from pharmaceutical companies Genentech and Celgene (Summit). They also sponsored a bounce-house ride for children, located near the Relay For Life walking track. For more information on the Carol G. Simon Cancer Center, visit atlantichealth.org/simon/. For more information on Relay for Life, visit relayforlife.com.